UK productivity growth has been puzzlingly slow since the crisis. After averaging 2% every year in the pre-crisis decade, growth in labour productivity (output per hour worked) has slowed to an average of only 0.5%. Extensive research and commentary on the productivity puzzles has suggested myriad causes for the malaise – including ‘zombie’ firms hoarding resources, sluggish investment in the face of uncertainty, mismeasurement and more – and have dismissed others that no longer seem plausible – including temporary labour hoarding. Using firm-level data, I show that slower aggregate growth is entirely driven by the more productive firms in the economy. In apparent contrast to my results, recent arguments have focused on the role that the weakest firms play in keeping down aggregate productivity. For example, Andy Haldane highlighted the ‘long tail of low-productivity companies’, which drags on the aggregate, in a speech last year and the OECD has published several papers (e.g. here [pdf] and here) analysing the divergence of the top end of the productivity distribution (‘frontier’ firms) from the rest (‘laggards’). These ideas have been very influential. But unproductive firms are not responsible for all of the UK’s issues. Using a new method that links aggregate productivity to its distribution across workers, I found that the slowdown in productivity growth is isolated in the top tail of the distribution of productivity across workers. The most productive firms are failing to improve on each other at the same rate as their predecessors did. You can see this in Chart 1 – the two lines track the average, annual change in productivity at different parts of the distribution across workers, before and after the crisis. The post-crisis line is well below the pre-crisis one, but only toward the right, the top tail of the distribution. Surprisingly, the bottom end of the distribution appears to have been growing faster in recent years than it was leading up to the crisis. The beauty of this chart is that the average height of each line is about equal to the change in the aggregate – so we can see which part of the distribution is moving (or not) to cause the aggregate to move. And, again, it’s the top end that’s doing the work. This fact doesn’t explain the puzzle. As with any statistical decomposition, we’re brought no closer to the why of the issue, but the where is a little clearer. That’s about all I have to say. The rest of this post provides the working behind Chart 1. In the next section, I sketch the method I used, and then I take it to UK data, giving a bit more flavour to the result, ending up right back at Chart 1. One thing this extra detail does is to confirm the headline results in Andy’s speech and the OECD’s papers. You can see the long tail of low productivity firms in Chart 4, and the divergence of the top end of the distribution from the rest in Chart 1. But in the data we have, these features are always there. So they can’t be to blame for the slowdown in growth. Indeed, if anything, the increasing dispersion is where aggregate growth usually comes from. In this light, the UK growth puzzle is there because the increasing dispersion has slowed down since the crisis. So how did I get to Chart 1? where and represent firms and quantiles, is productivity, is value-added and is labour. is the quantile function of productivity across workers, it picks out the productivity of the worker who is more productive than exactly of the others. With this approximation, we can measure changes in the aggregate by averaging over changes in the centiles as well. Using the formula below, we can see which part of the distribution is moving (or not) to cause the aggregate to move. Note that we’re tracking growth in the distribution here – not growth in firms, nor the distribution of firm growth, so it could be that parts of the distribution move around or stay still, but the firms that are located there are shifting around a lot. So now that we have the method in hand, let’s apply it to UK data. I’m using ONS firm-level microdata (combining ARDx with ABS 2015), and measuring productivity as real value-added (using 2-digit sector deflators) per employee. This dataset doesn’t cover the whole economy – the surveys only try to cover the non-financial business economy (which is a shame given the importance of finance in the growth puzzle) and some other sectors only pop up from 2009, so I had to cut these from the whole dataset for consistency. Because of these survey limitations, the ‘aggregate’ in the below results is a subset of the overall UK aggregate economy. OK so let’s first check how close the approximation is. The charts below show actual productivity and its growth as measured from the micro-data, compared with the approximation. As you can see in Chart 2, the approximation has a consistent negative bias, because cutting out the top 1% drops some very large outliers, but the growth path is about right (Chart 3). 1. The productivity distribution is highly skewed (chart 4), so the top tail has a very strong influence on the aggregate. The distribution has a long tail of workers in unproductive firms at the bottom, and workers in a collection of the ‘happy few’ extremely productive firms at the top. This is a well-known feature of the productivity distribution, regardless of whether we weight by labour or not. An implication of this shape is that the top tail has a very strong influence on the level of aggregate productivity in any given year, just as large outliers will push up on any average. 2. The top tail has an even greater influence on changes in aggregate productivity from year to year. Over 70% of the growth in aggregate productivity between 2003 and 2015 was driven by the top two deciles. This is because the rest of the distribution doesn’t move around much; at least not in magnitudes that compare to movements in the upper tail (chart 4). Incidentally, this is the same thing as the OECD’s observation that the top tail is diverging from the rest. 3. The productivity puzzle (slower aggregate growth after the crisis than before) is located in the top tail of the distribution. We can locate the growth puzzle by comparing changes in the pre- and post-crisis periods. 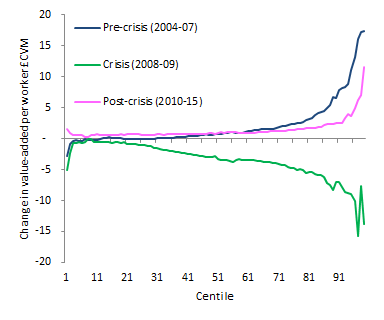 Chart 5 is a reproduction of chart 1 with an extra line; it shows the average annual change of each centile over three distinct periods – the pre-crisis years (2004-07), the crisis (2008-09) and the post-crisis period (2010-15). 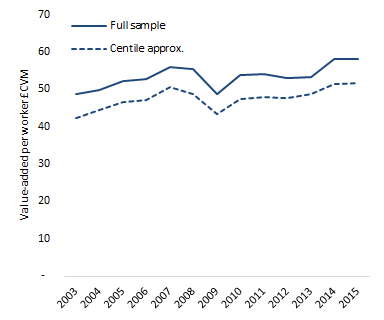 To read the chart, pick a centile and the three lines show how that part of the distribution changed, on average, over these different periods. 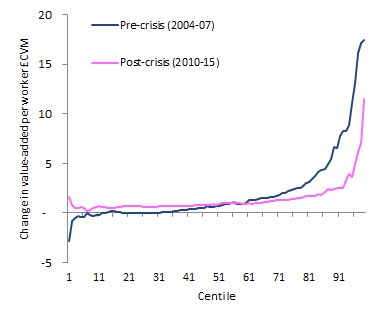 For example, the median grew at about the same rate pre- and post-crisis, and had quite a drop during the crisis. The growth puzzle is the gap between the pre- and post-crisis lines. 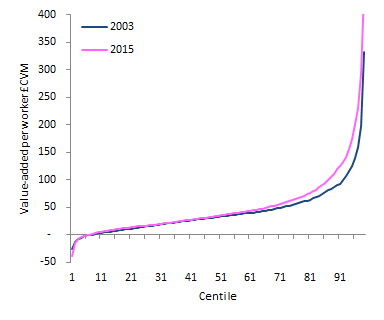 The chart shows that lower sections of the distribution have actually grown faster post-crisis than they did before it (pink line above the navy) and so cannot be driving the puzzle. By contrast, the top two deciles grew far slower (pink line below the navy) and therefore this is where the growth puzzle is located. Update 13/08/2018: The Bank Staff Working Paper mentioned above – Schneider (2018) ‘Decomposing differences in productivity distributions’ is now available here. Previous Post How does monetary policy affect the distribution of income and wealth? Dear Patrick, very interesting indeed, thanks for the post. Can i just ask: doesn’t this imply the opposite to what the OECD have found, namely that the gap between the frontier and lowest groups should have narrowed over time? Or do I misunderstand? This is an extremely valuable contribution to the debate. I was always sceptical about the OECD/Haldane theses, since they explained levels not changes. This conforms to the sectoral work we’ve done suggesting that the biggest changes were in high productivity growth sectors, which are no longer fizzing as they were. Thanks for this interesting work and for the opportunity to comment on it. On behalf of the authors of the OECD studies mentioned in the post, let us just emphasise two important points that relate to the interpretation of your findings and likely prevent a close comparison with existing work by BoE and OECD. Hopefully they also address some of the clarifying questions raised by other commenters. 1) Large firms vs. high productivity (“frontier”) firms? Although the post talks about workers, in fact we can measure productivity only at the firm level. This is important because to go from firms to workers, you need to weight by labour (i.e. employment), and while the post mentions this, it is not really explicit about the consequences of this step. It would be interesting to see more details on this, but in any case it likely affects the interpretation of the distributions that you are working with: they mix size and productivity effects. Consequently, changes at the top could come from several sources: changes in the size and changes in productivity of large and/or productive firms. 2) Are your findings driven more by differences across sectors than across firms (within sectors)? Since you rank firms’ (presumably, weighted) productivity distribution across all sectors, highly capital intensive sectors with large firms (e.g. 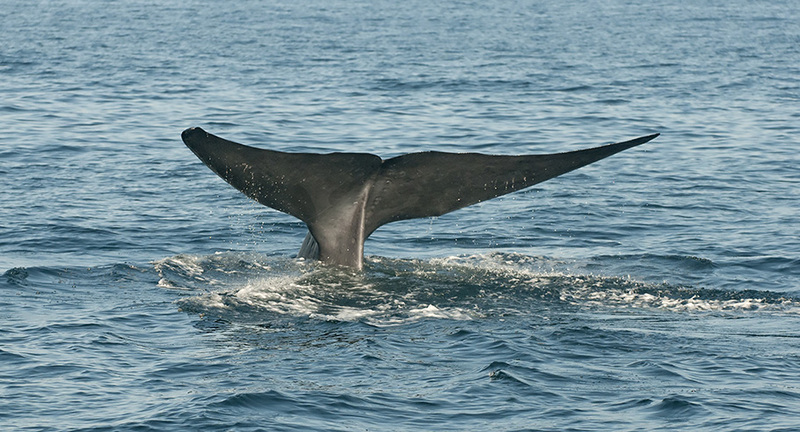 manufacturing) will naturally drive your upper tail. The works of Andy Haldane and colleagues at the BoE and the OECD, when discussing firm level developments, focus on within sector patterns, precisely to zoom in on those factors that can’t be accounted for sector-average patterns (and which are probably better suited to be analysed using sector level data). Happy to discuss further, and looking forward to the detailed paper behind the post. In response to Kim and Chris’ comments – we also wondered whether a reduction in the measured prod of the finance sector could help explain this. But this analysis doesn’t include finance (I think), so it must be something else. Really fascinating work – and discussion! I’ve been pondering whether or not the link between the OECD Future of Productivity results and these findings is that post crisis, leading firms are still pulling away from the rest – but at a slower rate than they used to. Does that square the circle? I also thought that could indeed play a role – and we actually found some evidence for a slower pace of productivity frontier growth post-crisis, mainly within manufacturing. But again, the comparison with Patrick’s results is somewhat difficult, given the important differences in how the frontier and the distribution are defined (see details in our post above). One feature of this very intriguing new piece of data analysis that you donât comment on, and that doesn’t seem to have been picked up in responses so far, is that (in chart 5) falls in productivity during the crisis are strongest in the top quartile of firms, where they mirror those in productivity growth in the before/after periods, that they must quite substantially offset.. [The middle also shows falls then which are clearly less balanced by growth before/after]. Though you dismiss labour hoarding as a relevant consideration generally ” and it is usually discussed negatively ” I wonder if it does not play a major role in these extreme fluctuations among the highest productivity firms. Specifically I would suggest that they may recognise a substantial part of their competitive advantage as lying in quite specific combinations of developed human capital within their workforce which are expensive to add to quickly in upswings and dangerous to dispense with during periods of reduced output. An initial test of how significant this factor is would be to see how far it is the numerator or the denominator of the productivity ratio which is primarily response for this pattern. 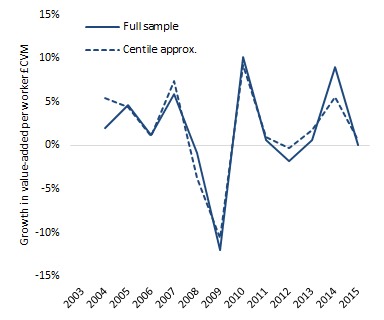 If there is anything in it, this would seem a reason for looking a bit more carefully at the dynamics of change to distinguish boom/bust effects from shifts in trends that may not simply be evidenced by pre/post crisis averages. Do you possibly have the data readily available to show us separate versions of Chart 5 for output and employment growth ?